The need for community-wide outreach. Reprinted with permission from Binah Magazine.Copyright 2008. All Rights Reserved. (718)305-5200. The call to outreach long predates our generation. As early as the 1920s, the Chofetz Chaim, in his famous Chomas Hadas, stressed our enormous obligation to reach out to unaffiliated Jews, as well as the severity of neglecting to do so. In the 1970s, prominent Gedolim (including Hagaon Harav Menachem Shach, the Steipler Gaon, Hagaon Harav Chaim Shmuelevitz, Hagaon Harav Moshe Feinstein, Harav Aryeh Kaplan, Hagaon Harav Simcha Wasserman, zecher tzaddikim livrachah, and, yblc”t, Harav Yisroel Belsky, shlita) spoke out, urging theTorah community to reach out to the wider Jewish population. Whether or not you are part of a kehillah in which outreach is encouraged, the message is still for you. The fact that most Jews are lost to Torah-true Judaism weighs heavily on our hearts, and merits our fervent prayers – it should even affect our distribution of tzedakah. If you have any doubt about the extent of each individual’s responsibility, read on. Klal Yisrael are baalei rachamim, innately compassionate people. Most of us, if we truly grasped the extent of the devastation that we are witnessing and the depth of our responsibility, would run to help and to learn how to help. What holds us back? Ohr l’goyim – we made a bris with Hakadosh Baruch Hu at Har Sinai to become a mamleches kohanim (a priestly nation), and thereby, an ohr l’goyim (a light unto the nations). We examine these concepts, one by one. Areivus means being responsible for each other. It is a responsibility that is rooted in the commitment each of us made as a nation at Har Sinai. Mishnas Rav Aharon, a collection of shmuessen of Hagaon Harav Aharon Kotler, zt”l, includes a discussion of Kiddush as an example of areivus. Why can a man make Kiddush for someone else, even though he already made Kiddush for himself? Wouldn’t that entail a brachah levatalah? The answer is that since we are all interconnected parts of a whole, he has a responsibility to make Kiddush for someone else who has not yet heard Kiddush. Let’s clarify this further, through the bone-chilling exchange we find in Yechezkel (9:4) between the Middas HaDin and Hakadosh Baruch Hu at the time of the churban Beis Hamikdash. The dialogue is cited in the Gemara (Shabbos 55a), where we learn that there was only one occasion on which Hashem reversed a favorable decree. “One consists of the perfectly righteous, while the other consists of the absolutely wicked,” answers Hakadosh Baruch Hu. “If it is revealed to You, was it then revealed to them?” queries the Middas HaDin. It was not revealed to the tzaddikim. In an unprecedented action, Hashem overturned His good decree for the tzaddikim, and they were destroyed. The Chofetz Chaim, zt”l, in his sefer Chomas Hadas published in the 1920s, brings a powerful example of areivus. After 120 years, a person goes up to Shamayim and is asked why he didn’t keep Shabbos. He protests that hedid keep Shabbos faithfully throughout his entire life, meticulously observing both the letter and spirit of its laws. But the heavenly Beis Din challenges him, questioning him about people who did not keep Shabbos. Did he reach out to them and try to draw them near to observance of Shabbos and the ways of Torah? If not, he is judged as having failed to keep Shabbos! The root of this understanding takes us all the way back to Avraham Avinu, says Rav Weinberg. The Rambam, in Hilchos Avodas Kochavim (1:1-3), teaches us that the world spiraled downward from Enosh, until Avraham found Hakadosh Baruch Hu.The Raavad on this Rambam asks: What about Shem and Ever, who taught Torah long before Avraham’s birth? They also lived during Avraham’s time and had a great yeshivah where both Yitzchak and Yaakov studied. Why aren’t they credited with having saved the world? The answer given by the Kesef Mishneh (Rabi Yosef Caro) is that though Shem and Ever were loyal and lofty servants of Hashem, and taught Torah to those who came to their yeshivah(including Yitzchak and Yaakov), Avraham was the first to be “korei shem Hashem.” The difference between their conduct and that of Avraham is that the latter called out in the name of Hashem, traveling and reaching out to teach people about the one G-d, giving tochachah to idol worshippers, showing them the falsehood of their beliefs, and drawing them near to G-d.
What does it mean that Avraham was korei shem Hashem? Avraham was impassioned for thekavod of HaKadosh baruch Hu. It was not enough that he recognized Hashem and conducted his life in accordance with this recognition, when he was surrounded by a world that did not. He felt compelled to go forth and bring others to the recognition and service of their Creator, and this distinguished him. The path to recognizing and promoting kavod Shamayim in our time is not to reject and ignore those Jews who have no concept of HaKadosh Baruch Hu, which perpetuates achillul Hashem of catastrophic proportions. If 90% of Jewry is not keeping mitzvos, then each of us has a share of the accountability, for we are all responsible for one another. For the kavod ofHaKadosh Baruch Hu, we must do something about it! Pirkei Avos (1:12) cites Hillel as saying that one should be among the disciples of Aharon, “…oheiv es habrios u’mekarvan la’Torah – loving your fellow men and drawing them near to the Torah.” On this Mishnah, Rav Chaim Volozhin says that the highest act of v’ahavta l’rei’acha kamocha is to give another Jew Torah. When we help him draw near to the Torah, we are tending to his deepest need and giving him the greatest gift. The concept of tochachah (rebuke) must be applied with a clear understanding of what it entails. Although harsh communication is often associated with the term tochachah, this is misguided. In fact, tochachah is meant to reach the heart of the recipient and rouse him to make a change. Before we offer tochachah, we must search ourselves to be sure that we are only motivated by love and genuine concern for the other, and that we express ourselves in a way that conveys this to the recipient. If not, we will be committing an aveirah. This is particularly important in outreach, because the other person must not feel judged or criticized, but rather should experience your sincere interest in him and your desire to connect with him. Assimilated Jews often feel that religious Jews judge and disparage them. Outreach efforts that don’t come from the heart will likely leave the person feeling that he is your “project” and a potential statistic. The Rambam in Hilchos Dei’os (6:7) states that when you see a Jew committing an aveirah, you should explain to him that it is not good for him to be doing the aveirah, and you should encourage him to correct his ways. Even if the person is not receptive, you are still obligated to return a second and third time. The Rambam goes further still, stating that if you do not do this, you will receive a part of the punishment for the aveirah! This imperative is also echoed in the words of the Chofetz Chaim, who draws a parallel between the expectations of a Jew towards his fellow Jews who is straying and the energy one would expend when faced with a failing business. If your business were failing, you would use all your strength and creativity to figure out how to save it. You would keep trying every way you could, without giving up or slacking off in your efforts. Likewise, the Chofetz Chaim says, we must not give up on alienated Jews or become discouraged after an initial effort or two. Rather, we must continue reaching out, with devotion and sincerity, so that they have a real chance to draw them near to Hakadosh Baruch Hu and His Torah. In Chomas Hadas, the Chofetz Chaim discusses the mitzvah of hashavas aveidah, the obligation to return a lost item to its owner. If this mitzvah applies to objects, then kal v’chomer (all the more so) to lost souls. When we reach out and “touch” an assimilated Jew, we are helping him repossess his neshamah (soul), which has become lost to him through lack of proper education and exposure to Jewish life. Furthermore, when we help a fellow Jew return to Torah, we are giving back to Hakadosh Baruch Hu one who has gone far away from Him. The Torah commands us not to stand idly by while someone’s blood is being spilled. The Chofetz Chaim gives the example of people drowning. Would we say we don’t have time to help, that we are not cut out for trying to save? Or would we do everything in our power to rescue those whose lives are in danger, either directly or with the help of others? The Chofetz Chaim says that if this is true physically, it is all the more so spiritually. When we see a Jew who is spiritually drowning, it is our obligation to extend him a lifeline. We are meant to be a light unto the nations of the world, that brings all people to the recognition of Hakadosh Baruch Hu and to His service. We entered into a covenant at Har Sinai that we would keep this commitment as an am. But how brightly can the light of Klal Yisrael burn for the nations of the world, if most of its members are lost to assimilation? Although the accomplishments of the “kiruv world” are extraordinary and continue to bring tens of thousands of Jews back to their heritage, kiruv professionals are engaged in a war of attrition. They are winning battles, but losing the war. There are about 5 million Jews in America, and 90% – about 4.5 million – are unaffiliated. Approximately 25% of American Jews are practicing religions other than Judaism – 1.3 million of our brethren! Do most of them identify with foreign religions because they find them more enlightening, or rather because they are so ignorant of the Torah that they are easily drawn into non-Jewish faiths? If they are affiliating elsewhere, they are searching for meaning, and we were not there to offer it to them. They had no way to connect with us or with their precious heritage. Even if each of the current roughly 1,500 kiruv professionals is able to bring 100 individuals back to Torah and mitzvos – an aggressive estimate according to one kiruv professional with whom we spoke – that would still leave 4.3 million Jews who have not even been reached! What this tells us is that the Jewish People desperately needs troops on the ground – in other words, you and me – for the majority of Hashem’s children to have a chance of returning home. Although many programs and institutions exist that can effectively undertake the education of assimilated Jews once there is interest in learning and experiencing Torah, millions of Jews must first be roused to interest. 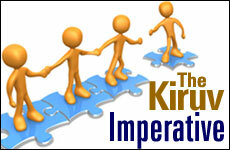 It is up to us to dramatically and fundamentally reframe our understanding of kiruv We need to take ownership of kiruv as an urgent obligation on each individual shomer Torah u’mitzvos to draw assimilated Jews we know and meet near to us, to HaKadosh Baruch Hu, and to His Torah – with love, respect, and compassion. Most never had the chance to know or experience what it means to be a Jew. The same can be said for many, if not most, of their parents. As their lives are at stake, so are our own. Let us overcome fear, insecurity, and lethargy about taking up this challenge, and equip ourselves to go forward with warm hearts, courage, and some basic tools for success. Opportunities for these initiatives abound in our day-to-day lives. We simply have to care, and act on that caring. They are part of us, those 4.5 million assimilated Jews, but they are missing from our world, bereft of a living chelek (share) in the Torah. If we do not reach out to them, we will, chas v’shalom, be similarly bereft. We must allow this reality to penetrate our hearts and souls, propelling us to action. the internet provides the best opportunity for our sages to expose the truth and spiritual benefits of torah study to those who are in the dark. to truly change the numbers of Jewish people turning away from judaism is by changing the ways of teaching Torah so that jews of all religious backgrounds can feel welcomed not only orthodox jews.